Before the second week of February this year, my answer to that question was the Ferrari F430. The playful Italian can propel itself with gusto from zero to 100 km/h in just 3.8 seconds. But now the F430 no longer holds that title. It’s lost it to a car that is a dime a dozen in California and even in Toronto. That very same car makes about as much sound as a butterfly. 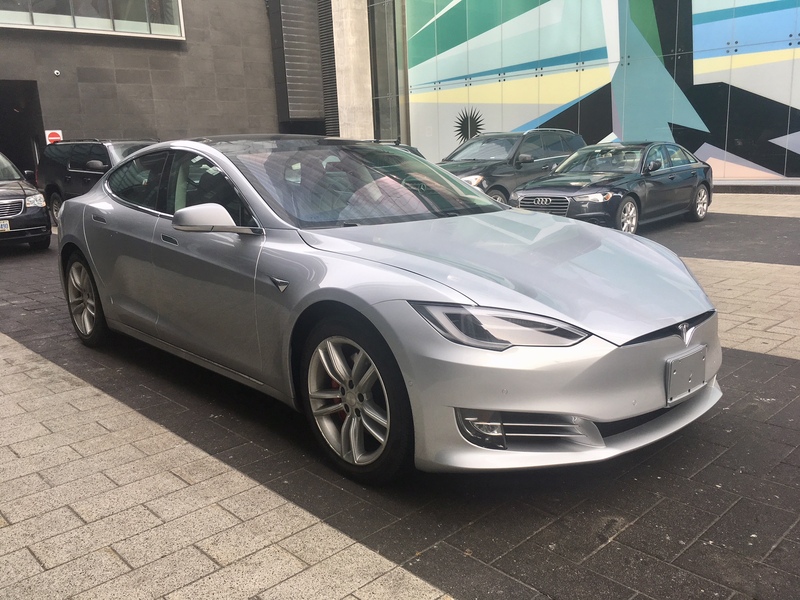 The Tesla Model S is not Tesla’s first mass produced vehicle (that honour goes to the Roadster), but it is the model which helped thrust the brand into the mainstream automotive foray. It’s a car that can seat four comfortably while being able to carry all their stuff, looks elegant, has all the latest tech, uses absolutely no gas and, depending which trim you get, is tied with the Koenigsegg Agera S as the fastest production car in the world. The Tesla PR bunch kindly reached out to ask if I wanted to have a go. Which is a bit like asking someone if they wouldn’t mind taking a million dollars. How could I say no? 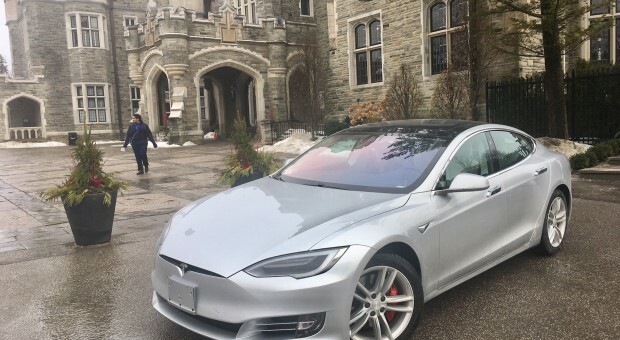 The first thing you’ll notice while driving the Tesla in Toronto is that no one notices you driving a Tesla while in Toronto. 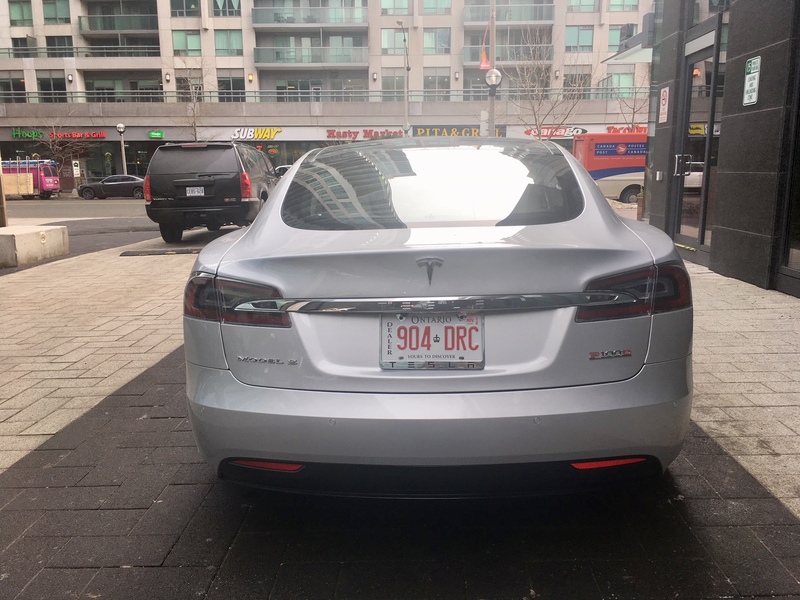 As I alluded to, spotting a Tesla of any kind in Canada’s centre of the universe is a bit like spotting a BMW 3-series. They’re everywhere there. As such, no one tends to notice the close to $200,000 car that silently whisked by them. That’s not to say the Model S’s styling is a bore. Sure, it’s not as radical as a Lamborghini, but the classic lines and a sleek profile still work well, despite now being the oldest model in Tesla’s current lineup. 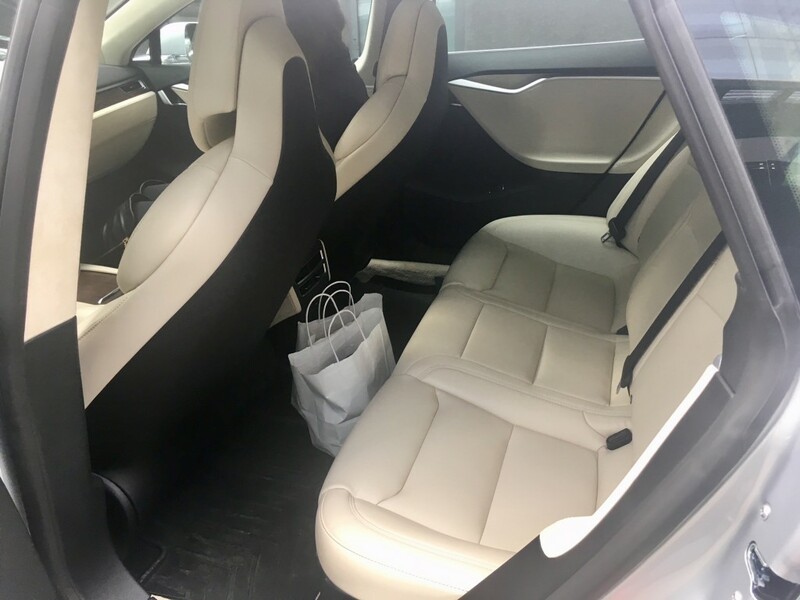 Having never before experienced a Tesla, a friendly member from the communications team gave a walk through which included lots of things that Tesla does unconventionally. The first is the key itself. 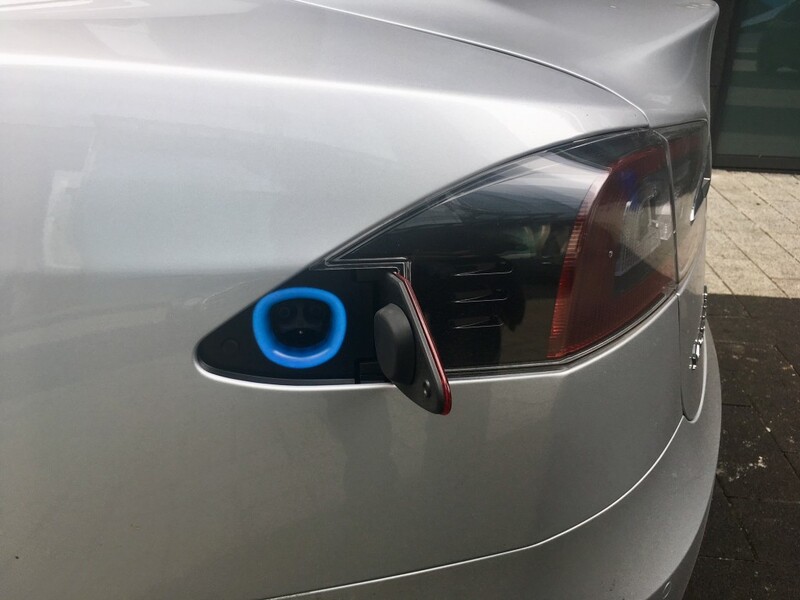 It’s in the shape of the Model S and while Tesla is not the first to do that (hi Porsche), it is the first to include no visible buttons. It works a bit like a voodoo doll. Want the front hood to open? Hit the front hood on the key fob and the hood pops open. Want to unlock the doors? Doing the same action awakens the door handles which are otherwise kept flush with the body. It’s all very futuristic and neat, but it does take some getting used to. Likewise, starting and stopping the car is quite avant-garde. There is no ignition switch to put a key into and no button to push. Simply put your foot on the brake and, voila! The Model S is now awake and ready for new adventures. Those who have ever been in a modern Mercedes-Benz will recognize the gear shifter which is placed on the steering column; it’s taken directly from Daimler, which actually isn’t a good thing because, as I’ve complained about in the past, that gear lever stalk is both tiny and flimsy to use. 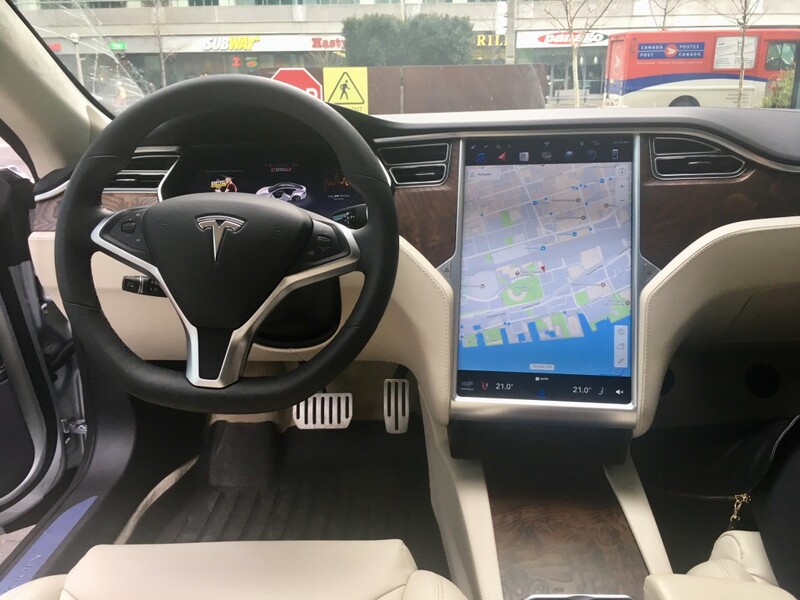 No matter, the Model S makes up for it in many other ways such as the large 17-inch tablet-style screen on the centre of the dash, which commands everyone’s attention. This screen is where everything happens – so much so that there are only two buttons on the entire dash; one for the hazard lights and another to open the glove box. This creates a cleaner design, but also creates a bit more complication for simple tasks. For instance, there’s lots of different menus and sub menus to turn on the heated seats, or adjust the fan speed. The good news is it’s easy to use (especially if you’re familiar with using a tablet) and the system responds to commands quickly. On top of it, a lot of the basic every day controls can be found in button-form on the steering wheel if you don’t want to fiddle about with the screen. Still, opening the sunroof can be a three-step process. 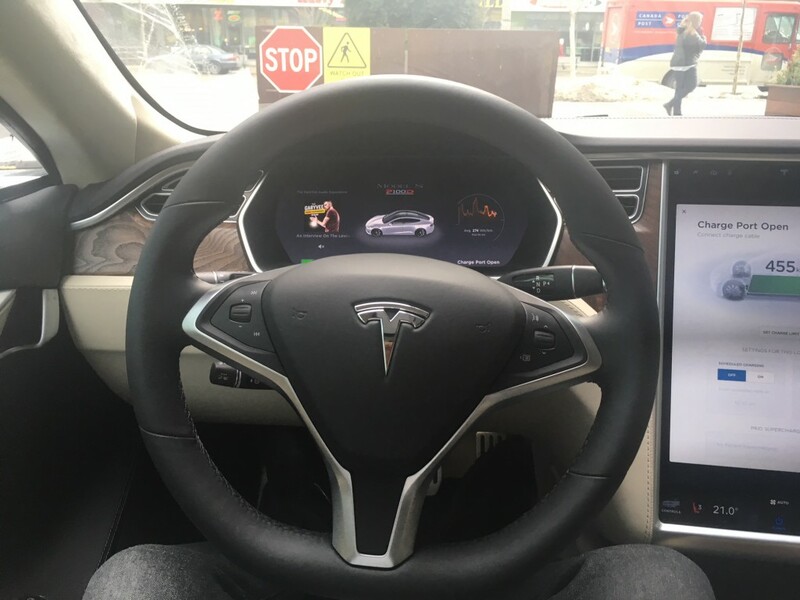 The software for the infotainment system is developed in house which means Elon Musk himself had plenty of input. It’s also the reason why you can change the navigation to show your Tesla on Mars, or you can change it to be in a James Bond setting. You can also draw and doodle if you’re stuck in traffic or attempting to entertain children in the back. 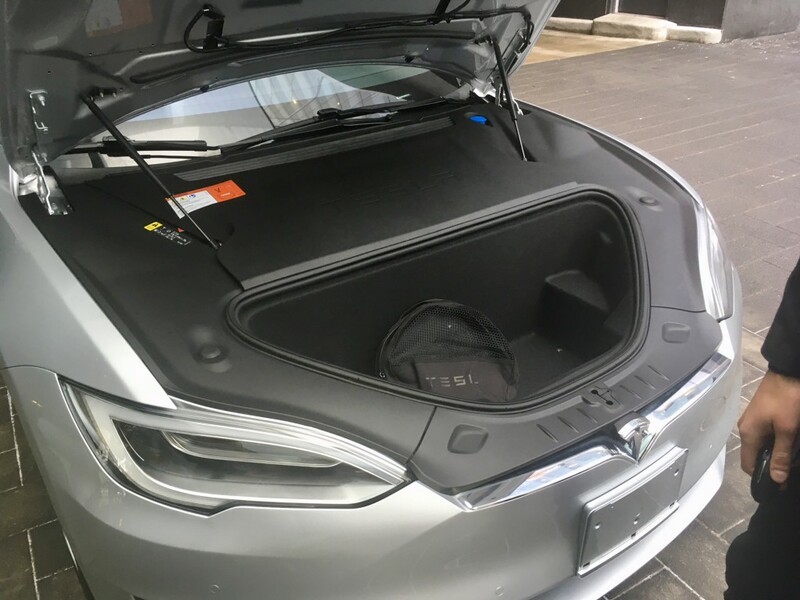 The navigation system itself can not only let you know how long your journey will take, but it will also let you know how much of the battery is needed and will calculate a route near Tesla’s supercharging stations if your destination is farther than a full-charge can handle. 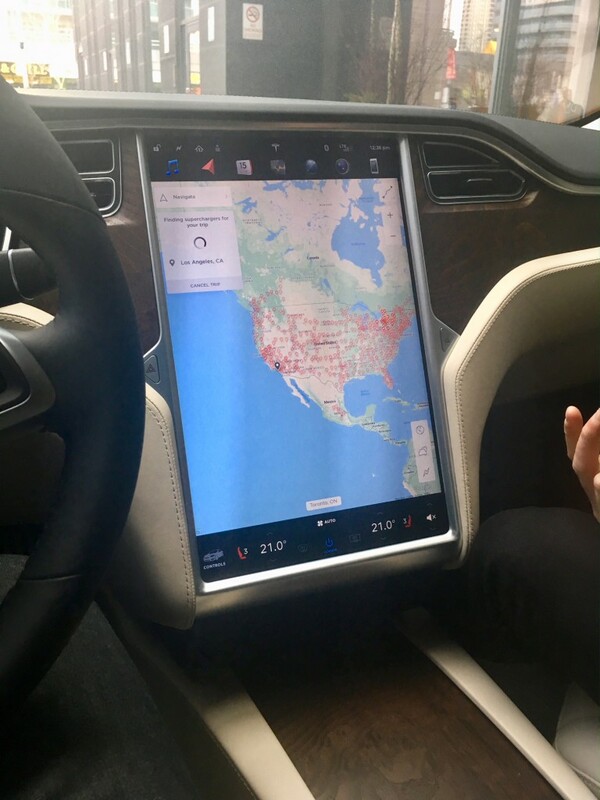 It’s all quite useful, though during the demonstration, the Tesla took an unusually long time to calculate a route from Toronto to Halifax – so much so that we had to use a new destination (New York City). 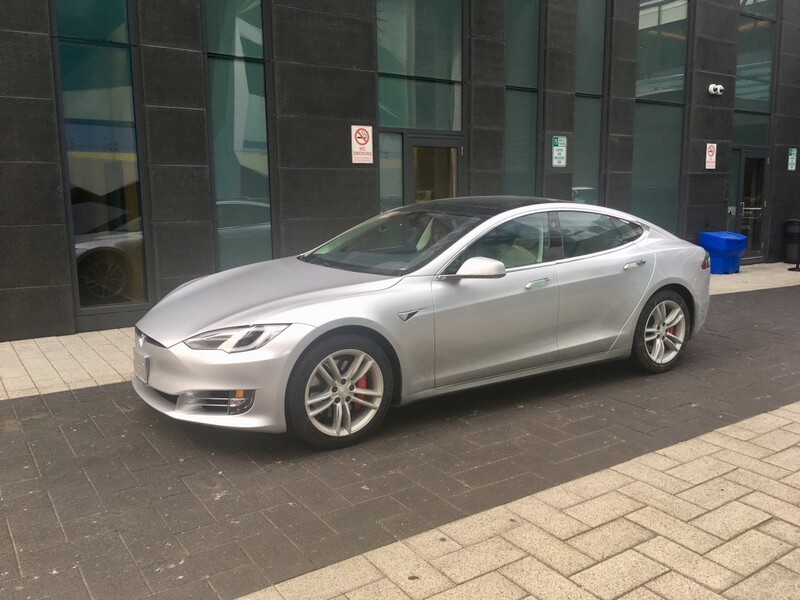 That could be because there are currently no supercharging stations in Halifax, but Tesla will be installing them in the near future. The Model S gets dual electric motors. 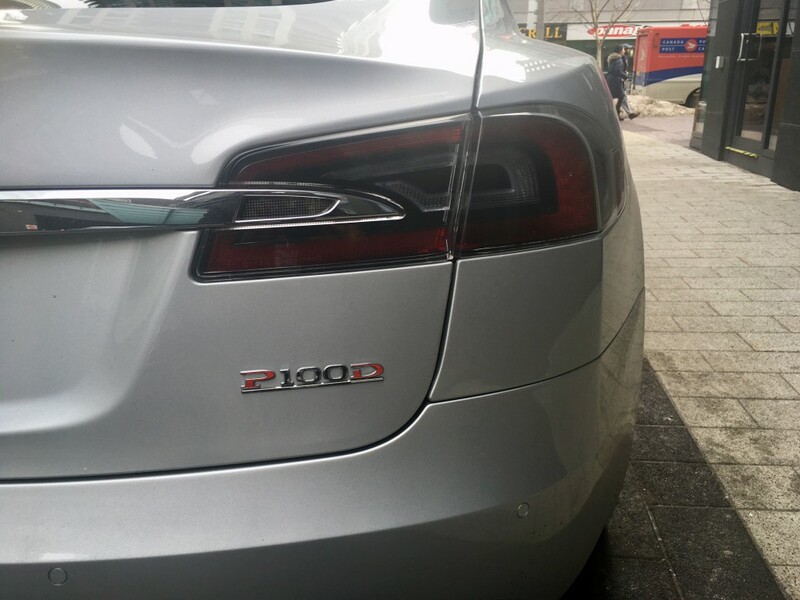 There’s one up front where a gas engine would typically be, and there’s a high performance motor in the rear, which is exclusive to the P100D trim. This gives it an all-wheel drive system of sorts providing it with independent traction in both the front and the rear. There is, of course, only one gear. 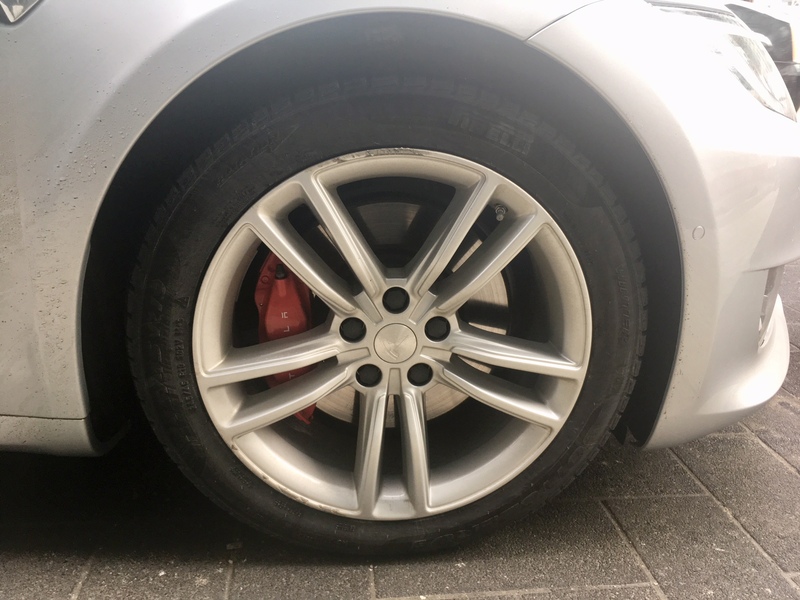 The amount of range you get depends on many different variables from which trim level you get, what size wheels you order, how fast you go and the outside temperature. 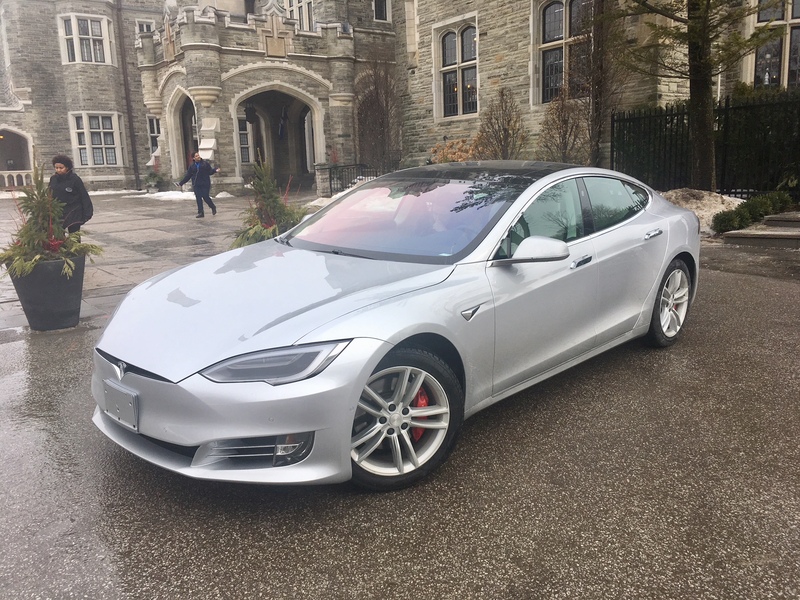 If we take the way my tester was equipped, which was the P100D with 19-inch wheels and you match it with a typical summer temperature in Canada (20 degrees Celsius) and go the speed limit of the Trans-Canada highway, you can expect to receive 508 kms in range, according to Tesla. That’s in the same ballpark of most gasoline vehicles on sale today. 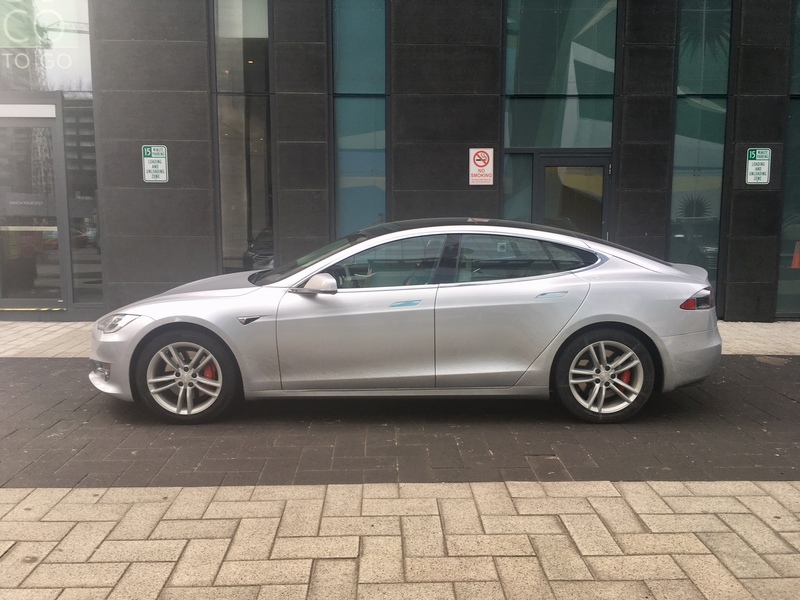 Driving the Model S around town is a simple and quiet affair. The regenerative braking system takes a bit of getting used to. It’s the most aggressive feeling system I’ve experienced but once you’ve gotten the hang of it, it feels no different than driving a big luxury sedan around town. My tester did not come equipped with absurdly large wheels with tires so thin they are painted on, so bumps and potholes were largely unfelt – same goes for the street car tracks in Toronto. Torontonians love to feel as if they are getting to where they need to go quickly. As such, they tend to floor it from a traffic light in the right hand lane and cut in front of you simply to be ahead of the pack. Knowing the Koenigsegg is the only car in the world that can give the Model S a run for its money from a standalone start certainly made it very tempting to shut these traffic cheaters down in their tracks (and indeed I succumbed to that temptation a few times), but course, as with any car, flooring it means you lose your means of propulsion more quickly – in this case I would have been wasting precious electricity had I blocked off every jerk driver in Toronto trying to push their way through. 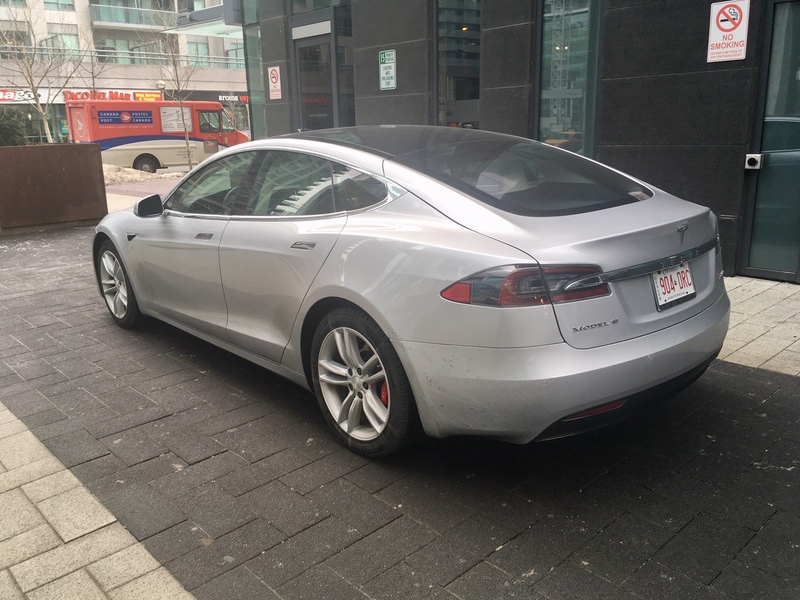 Once you make it out of the chaotic downtown core and onto a highway, the Model S shines. Taking the onramp is but the simplest of tasks. You can certainly feel the weight of the battery when cornering, but it still feels planted and sure of itself. Passing on the highway is as easy as – and done just as quickly as – a blink of an eye. It blissfully sails along at highway speeds while maintaining an impressive level of comfort. It’s this type of road where I was able to try out the auto-pilot system. The auto-pilot system is probably the closest we’ve seen to fully autonomous driving. You basically set the system and it drives the car itself – meaning it will keep itself within its lane, it will speed up, slow down or stop completely depending on the flow of traffic. It will even make a lane change itself, all you have to do is trigger the turn signal, and if it’s safe to do so, then you’ll find yourself effortlessly in the next lane. The Model S is happy to take control of the responsibilities of driving for 90 seconds. After that period of time has elapsed, it will prompt you to grab the wheel. Should you fail to do so, it will prompt you again. And again. And again, all with the visual and audible prompts becoming more frequent and aggressive. If you still do not grab the wheel, it will assume you’ve suffered a catastrophic health condition and are no longer able to drive. As such, it will safely pull itself over to the side of the road and turn itself off. I’ve driven semi-autonomous systems like this in a few Mercedes-Benz products, and while having the ability to quickly take your hands off the wheel to grab a swig of coffee and a bite of bagel is nice, the experience itself is still rather unnerving. It should also be noted that Tesla does not encourage any sort of distracted driving, regardless of whether you’re in pilot mode or not. Even with Tesla’s system being the most advanced on the market, I still found myself reacting by grabbing the steering wheel thinking it won’t notice that the shoulder is now suddenly curbed, or thinking it isn’t slowing down enough for the traffic up ahead. This is all human nature, and the Model S knows exactly what it’s doing, but still, it take a lot of getting used to. And it still isn’t perfect. For instance, it will not react to potholes ahead. But, as my Tesla PR guy reminded me more than once, the system is meant as an assist only and not a full on autonomous system. As long as you keep that in mind, and still keep at least one eye on the road, the system would seem to make a fair amount of sense. Now, let’s get back to how quick this thing is from 0-100 because it is almost indescribably quick. I literally almost gave myself whiplash. You can feel your organs push up against your spine. The G-forces arrive to your face with delight. It is something every speed nut needs to experience at least once. It’s quite incredible. And indeed, the Model S itself is quite incredible. It is easily one of the most futuristic cars on the market today. Those who fear Tesla and other electric cars will cannibalize their twin-turbo V8’s and V10’s need not worry. The only thing you’ll miss is the sound track from those engines. And I admit going as fast as the Model S can go completely in silence is unnerving, you do get used to it quickly. And get used to it you should because most automakers have made it quite clear that this is the direction the industry is headed, whether you like it or not. But if the Model S is any indication you will quickly be amongst the ‘like’ camp. This is a remarkable car, to be sure. Is Apple Looking To Buy Tesla?